Life Management Platform: APIs for Push and Pull? What the Life Management Platform concept really needs to move forward is definition and demonstration of a set of open, secure APIs to implement “informed pull” and “controlled push” information sharing capabilities for real. Acting on advice from Dave Kearns, I pinged Martin Kuppinger and Craig Burton to find out if anyone was working to specify such API’s. Craig suggested that I take a look at the Evented-API specification written by Sam Curren and Phil Windley, which calls for event generators and consumers to interoperate in a loosely-coupled fashion. So, in response to Craig’s suggestion, I prepared the following diagram to illustrate my high level take on how the Evented API concept might work with a Life Management Platform to deliver some real value. Multiple financial institutions with which I do business (e.g. banks, credit card companies, mortgage companies) could publish financial transactions (either singly or in sets) via event generators. My employer could publish pay slip information in a similar fashion. 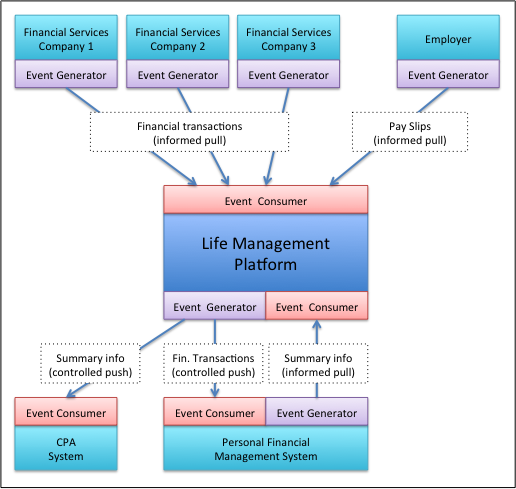 The Life Management Platform could receive this information via appropriately-authorized and secure event consumers. These would be “Informed Pull” transactions. The Life Management Platform could in turn publish all or parts of the financial data collected in this manner as “Controlled Push” events which could be consumed by my personal financial management system. I could then manipulate the data as necessary. Summary data might be published as an event and consumed by the Life Management system in an “Informed Pull” fashion. The summarized information or parts thereof could be made available via a “Controlled Push” event to a computer system used by my CPA to prepare my taxes. What do you think? Is this a reasonable use case for a Life Management Platform? Is this the way Evented APIs are suppose to work? Any ideas or critiques would be most appreciated.